J. Banks Designer, Cindy Munn, was selected by Innovation’s owner, Woodfield Development, to design the model home and clubhouse for the high-end luxury apartment community located near downtown Greenville. Munn worked closely with architect Robert Travis, Chad Askew and the teams at The Housing Studio and Shah Architecture on space planning and overall design and selected interior and exterior colors and finishes, furnishings and fabrics, as well. The project was designed in an international style, to be consistent with the architectural guidelines of the Millennium Campus adjacent to the Clemson ICAR campus. This style uses a mix of iron, glass and steel with very clean modern lines stripped of applied ornamentation and decoration. Munn gave homage to the Bauhaus School of Design by focusing on pieces by some of the most influential designers of that era such as Walter Gropius, Le Corbusier, Mies Van der Rohe and Frank Lloyd Wright. Innovation Clubhouse has Corbusier and Gropius chairs as well as the Barcelona chair by Mies Van der Rohe. The community offers one-, two- and three-bedroom apartments and luxurious amenities including a resort style saltwater pool, bocce courts, dog parks, fitness studio, Internet café and coffee bar, and indoor/outdoor kitchen. 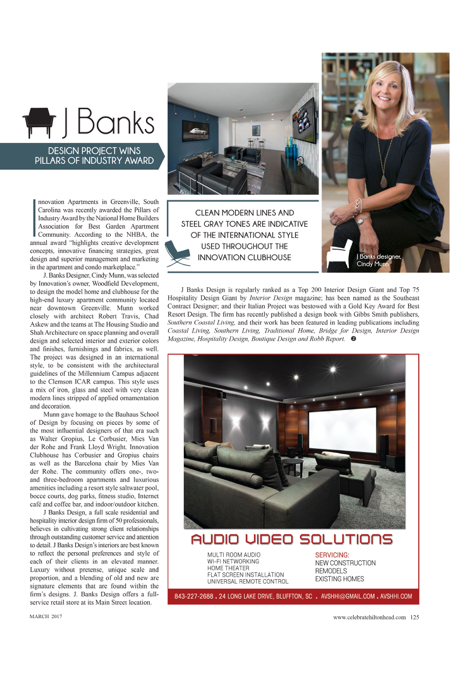 J Banks Design, a full scale residential and hospitality interior design firm of 50 professionals, believes in cultivating strong client relationships through outstanding customer service and attention to detail. J Banks Design’s interiors are best known to reflect the personal preferences and style of each of their clients in an elevated manner. Luxury without pretense, unique scale and proportion, and a blending of old and new are signature elements that are found within the firm’s designs. J. Banks Design offers a full-service retail store at its Main Street location. J Banks Design is regularly ranked as a Top 200 Interior Design Giant and Top 75 Hospitality Design Giant by Interior Design magazine; has been named as the Southeast Contract Designer; and their Italian Project was bestowed with a Gold Key Award for Best Resort Design. The firm has recently published a design book with Gibbs Smith publishers, Southern Coastal Living, and their work has been featured in leading publications including Coastal Living, Southern Living, Traditional Home, Bridge for Design, Interior Design Magazine, Hospitality Design, Boutique Design and Robb Report. Looking For A Beach Body? Get in Shape Now!